Hi! It’s ME again (Robin) I had fun creating three cards so I thought why not share them all? 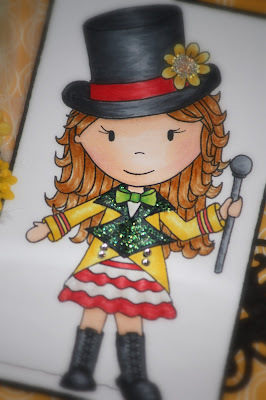 This image is “Ringmaster Ellie” you can pick her up right HERE…The moment I saw her I was in LOVE, I knew that she would be so fun to color and she needed fun colors. I decided on an easel card, my easel cards are generally 5.5″ square. I used fun papers in red, yellow and green. I really need to keep track of my paper manufacturers. I will work on it; my problem is that I used scraps when possible. I dig through my scrap bin and then I loose track of what is what. Anyways, here is the star of the show. 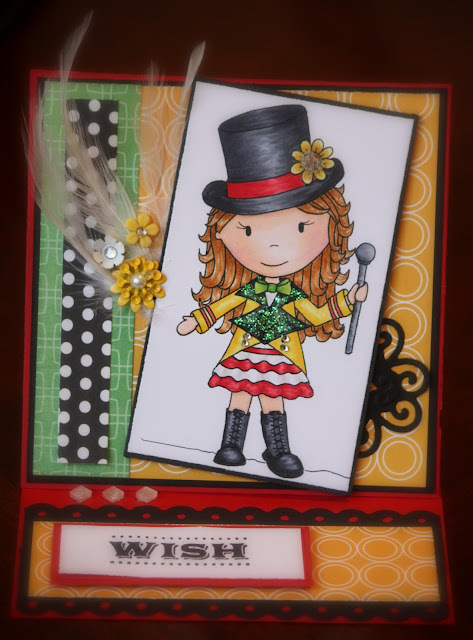 She has a cute black top-hat, black boots, a yellow coat accented with rhinestones and sparkles.